Developer obtained rezoning in order to build a ten-story tower on top of a three-story medical facility currently under construction. On June 29, 2010, the City Council approved Sean Daneshvar’s rezoning proposal to facilitate the development of a thirteen-story building at 621 East Fordham Road in the Belmont section of the Bronx. The site is occupied by a one-story medical facility that Daneshvar is currently enlarging to three stories pursuant to a BSA variance. The lot’s southern two-thirds is zoned C8-1, while the northern portion is zoned R6. Daneshvar requested that the City extend the R6 district to include the lot and apply a C2-4 overlay in order to build a ten-story residential tower on top of the three-story medical building. The thirteen-story project would provide 58 market- rate units, 22,800 sq.ft. of ground floor retail space, and a 134-space underground garage with an entrance on Hughes Avenue. The surrounding area is characterized by a range of residential, commercial, and institutional uses, including the nearby 29-story Keith Plaza Apartments and Fordham University’s Rose Hill Campus. Bronx Borough President Ruben Diaz Jr. supported the project on the condition that Daneshvar promise to build the underground garage and provide an alternate garage entrance along the site’s western edge on Belmont Avenue. Daneshvar owns a 96-space parking lot across the street from the site, and Diaz requested that the lot remain available for the project’s accessory use. At the City Planning Commission’s hearing, Daneshvar addressed the borough president’s recommendation, stating that he would guarantee that the accessory parking lot across the street would remain available. Bryan Cave attorney Margery Perlmutter, representing Daneshvar, explained that an alternate parking garage entrance would be problematic because Belmont Avenue is a one-way, dead-end service road. Representatives from local community groups expressed concerns about the project’s height and its negative impact on traffic congestion. A representative from the Four Bronx Institutions Alliance suggested that rezoning would undermine a broader rezoning study under consideration by the Department of City Planning. The Commission approved the proposal. It found that the building would not be out of character with the surrounding area, noting that buildings taller than 100 feet were in close proximity to the project. 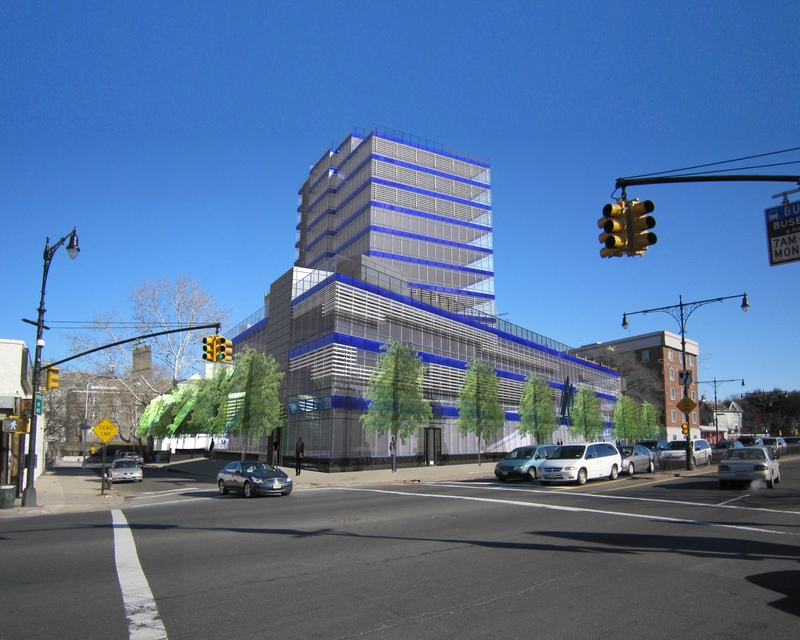 At the Council’s Zoning & Franchises Subcommittee hearing, local Council Member James Vacca questioned whether the project would be in context with the north side of East Fordham Road, noting that it would be the tallest building on that side of the street. Daneshvar’s attorney disagreed with Vacca’s assertion and pointed out that there was a fourteen- story building just north of East Fordham Road at East 191st and Hoffman Streets. No one spoke in opposition. The Council unanimously approved the proposal. Council: East Fordham Road Rezoning (C 090143 ZMX – rezoning) (June 29, 2010) (Architect: EM Design Group).